A collection of prayers and prayer ideas. Your family can pray together in fun and different ways. Prayer Calendar: At the beginning of each month, fill in a blank calendar with at least one prayer concern for each day. Use it every day, such as at dinner time. Gather in a suitable space and have someone read the prayer. Individuals can sign themselves or sign on others. One parent might sign each child as the other parent prays the prayer. Lay out the newspaper (or swipe through a news app) and let each person choose a story to pray about. Pray a prayer that has a variety of prayer types by using a simple ‘complete the sentence’ structure. Make chocolate chip biscuits (or buy a packet). When it comes to sharing them, everyone gets one and offers a prayer of thanks for every chocolate chip they discover! Take turns offering a prayer about something starting with each letter of the alphabet. Spin a globe (or flip through pages of a world atlas). 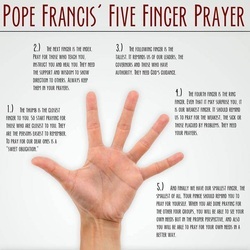 Where your finger lands, you’ll pray for that place in the world. Light a tea light candle for every prayer that’s offered. Encourage prayers of petition, thanksgiving and praise.